The following are authorised distributors for Citifluor antifadent products- including Antifadent solutions, photo bleaching solutions, and Immunofluorescence solutions. Please feel free to contact them directly if they cover your area. If you are in a country outside these regions, or have any difficulty contacting a distributor, please contact us directly. For all other countries please order directly from Electron Microscopy Sciences. Please see Red Star Vietnam Co., Ltd.
KLB Instruments Co. (P), Ltd.
Toshniwal Brothers (SR) Pvt., Ltd.
N° 29 D, 1° Esq. Hsin An Instruments Co., Ltd.
No. 255-2, Jialin Road, Linkou Dist. 3F.-2, No. 520 Jhongshan Road, Linkou Dist. TEM-SEM Kim. Mad. Ve Lab. Cihz. Mustafa Kemal Mah. 2127 Sok. 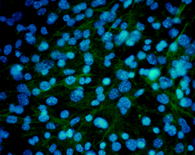 Human skin fibroblast cells through fluorescent microscope. DNA is stained in blue (with DAPI), Actin fibres stained green. Magnification ca. 400.